Over 1000 treasures to find! 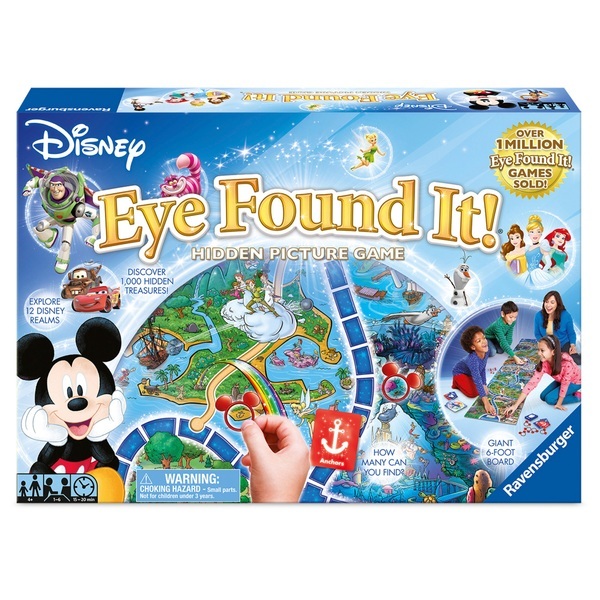 Join Mickey Mouse and friends with Disney Eye Found It Hidden Picture Game on an exciting race through 12 different Disney realms, from Radiator Springs to Peter Pan's Never Land and Pooh's Hundred Acre Wood. Along the way everyone searches for hidden iconic Disney objects. There are over 1000 things to find! With the help of fellow players, race to Cinderella's castle at the end of the giant 6-foot game board before the hands of the clock reach midnight. Set the clock to 1:00. Once the game starts the clock is ticking and players must work together to get to Cinderella’s castle before the clock strikes midnight. On your turn spin the spinner and either move, search, or tick the clock forward. If you spin the golden Mickey Mouse ear it’s time to search! Flip over a Search Card and everyone starts looking for the item on the card. For each item a player finds that is one step forward for all players. If all players arrive at the castle before the clock strikes midnight everyone win!